Do you want to embellish your home? As you probably noticed, the mid-century style is our favorite home design style, the one that inspires us the most. Today, we picked some mid-century lighting style pieces that definitely go along with 4 of the most popular interior design styles. Let’s make your home shine with style and personality! Mid-century modern is a throwback to the design style from roughly 1933 to 1965. There’s a retro nostalgia present, and functionality is always the main theme for this design. Aretha suspension lamp by DelightFULL not only has some of the most relevant distinguishing features of the mid-century modern style but also echoes this style. It’s an iconic piece with a contemporary reinterpretation of the lighting design classics from this era. The industrial style draws inspiration from a warehouse or an urban loft. In this style, structural elements are turned into showpieces, achieving a look that seems unfinished, yet cohesive and chic. There’s a lot of room for creating drama. Diana lamps by DelightFULL are the perfect lights to contrast high-gloss metal finishes with rustic/vintage furniture in your home. From floor and wall lamps to table and suspension lamps, “Diana” is ideal for big industrial lofts and artist studios. Hollywood Glam is a design style that tends to be luxurious, over-the-top and opulent. It’s a dramatic design style, perfect for a homeowner who enjoys making a statement. To match this style, the Brubeck lamps are an incredible choice. Inspired by Dave Brubeck, these lamps transmit luxury and constitute beautiful art deco pieces. 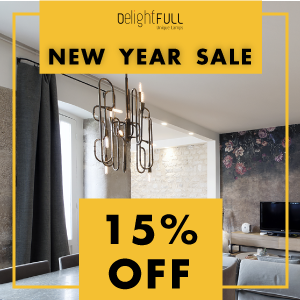 If you visit DelightFULL’s website, you’ll find various suspension, wall and floor lamps to brighten up your home with sumptuousness. Scandinavian homes are renowned for their simplicity, utility, and beauty. The center is around warm functionality, clean lines, flawless craftsmanship, and understated elegance. Once this style is characterized by using materials like aluminum and steel, there seems to be no doubt that Turner lamps are the right choice for your Scandinavian house! Available for the floor, the table, and the ceiling, Turner is a versatile piece that can be used in almost any room of your home. To begin with, it’s important to establish that contemporary and modern designs are not the same thing. Contemporary describes design based on the here and now and, for that reason, it’s a style that’s always evolving. Contemporary is more fluid than modern and can represent a sense of currency with less adherence to one particular style. We hope you enjoyed this article about what mid-century lighting style is the right one for you! What do you think? Let us know your thoughts, needs, and wishes and leave a comment. You can find more inspiration and information about interior design, DIY ideas, and event the other articles on home design ideas.